First make the brine. Put all the ingredients except the lemons into a large saucepan. Bring to the boil, stirring to dissolve the salt and sugar. Transfer to a bowl or container that will fit the chicken, add the lemon slices and leave to cool. Once cooled, cover with cling film and refrigerate. Before you go to bed, place the chicken in the brine, making sure it’s fully submerged. Cover with cling film or a lid and place in the fridge. Leave to brine overnight for about 8 hours (no more than 12 hours or the chicken will be too salty). The next morning, lift the chicken from the brine and pat it dry with plenty of kitchen paper. Place on a rack in a large roasting tin and return to the fridge, uncovered, for another 6–8 hours to dry out the skin (ready to crisp up in the oven). Take the chicken out of the fridge 30 minutes before cooking. Preheat the oven to 140°C/Fan 120°C/Gas 1. Mix the ingredients for the rub together in a bowl, then smear all over the chicken, to coat evenly. Return the bird to the rack in the roasting tin, breast side up, and put the lemon and rosemary in the cavity. Roast for 3 hours, basting from time to time. 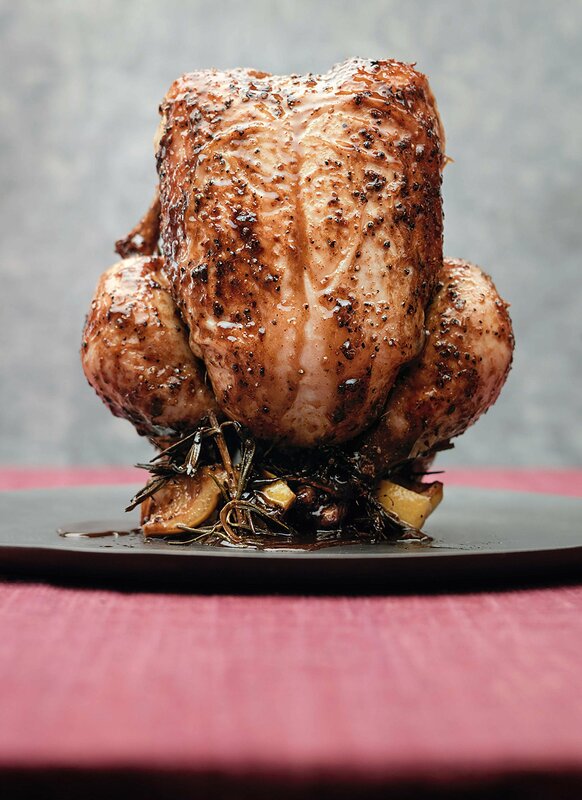 The chicken is cooked when a meat thermometer inserted in the thigh area near the breast (but not touching the bone) registers 70°C, or the juices run clear when the same area is pierced with a skewer. For the last 10 minutes, whack the oven temperature up to 220°C/Fan 200°C/Gas 7 to crisp and brown the skin. Remove from the oven and stand the bird upright to let the juices in the cavity pour into the tin. Cover loosely with foil and rest in a warm place for 10 minutes or so. Serve the chicken with the ‘gravy’ created by the juices in the tin, and seasonal vegetables.